Fall is tricky here in Central Virginia. Last week it felt like winter when evening temperatures plunged to 39ºF and daytime highs didn’t get out of the 50’s. Today, of course, the mercury is supposed to top out at 76ºF. The solution to all this up and down sartorially is to layer. And so, too, with the evening’s meal. Soup, makes an excellent first course or in sufficient quantity, a hearty and warming meal. Drop in two tablespoons of butter. About two to three cups of chicken stock. Have at it with the immersion blender until it looks like soup. Bring up the heat until just about ready to boil, stir, reduce heat, cover and let it sit for a bit to warm through. Garnish with crushed peanuts, shredded coconut, chopped scallions, parsley or whatever is at hand. Serve with a green salad and some crusty bread. We drank a South African white wine with the meal. 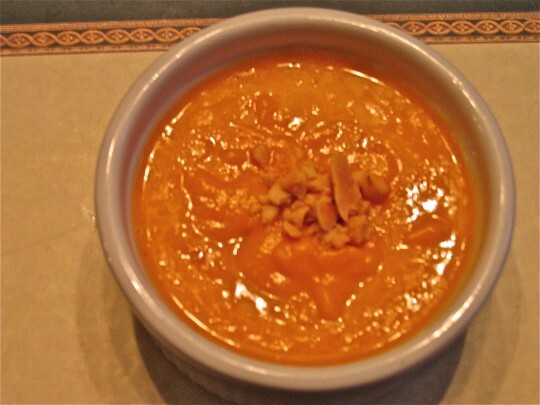 This entry was posted in Entertaining and tagged Immersion Blender, recipes, Sweet Potato Soup. Bookmark the permalink. Immersion blenders ROCK! I adore mine. It’s just the most useful tool ever. Mmmm, I love sweet potatoes in every form.Sounds yummy. PS I need an immersion blender! I just picked up my second bag of sweet potatoes from my CSA, this is perfect! This sounds delicious. I love a good soup. The weather has been very unstable here in Southern California as well. Very cold and rainy last week. Extremely hot this week. It is making for frustrating clothing choices. My Immersion blender just died. Now I am off to invest in a new one in the name of soup!